More than a year ago we reported on the launch of the New Horizons probe to Pluto. Back then Pluto was a planet, before the IAU reassigned it to the "Pathetic Little Iceball" category. Today, New Horizons swings by Jupiter to pick up a gravitational energy boost on the way to Pluto. It's worth the detour: the Jupiter encounter is adding nearly 20 percent to the probe's speed. The distances in the outer Solar System are such that the extra velocity more than makes up for taking a more roundabout route. To get as much extra oomph from the big planet, New Horizons is going to swing closer to Jupiter than any previous mission -- less than 5 million kilometers. The controllers at JPL get to try out the instruments and gather a little data during the flyby. Then everything gets put in sleep mode for the next eight years. Just to give you some sense of the scale of the Solar System, the probe will be moving at about 20 kilometers per second -- roughly 100 times the speed of sound -- for eight years. Even the data it beams home by radio will take five hours to make the trip! I find myself at a loss to understand how anyone can dismiss this as wasteful or pointless, yet devote their time and attention to anything as genuinely trivial as sports or entertainment -- both of which cost considerably more on an annual basis than New Horizons. A year after we warned you about the menace of Giant Rocks From Space, the United Nations has taken notice of the problem. The solution: they're going to have some meetings. Fortunately for those of us who live on Earth, the risk of asteroid Apophis crashing into the planet isn't as high as once feared. It's now down to 1 in 45,000. That's reassuring, because I'm sure many people's reaction to the news that the UN was going to deal with the issue was the same as mine: "We're all going to die!" Apophis is a relatively tiny asteroid -- only 300 meters across and weighing in at a mere 20 million tons. Of course, such a mass striking the Earth at planetary speeds would release as much energy as all the world's nuclear weapons. If it struck in the ocean (as would be likely), the splash would likely cause tsunamis across large areas of seacoast. Dust from the impact would affect climate for years afterward. The science fiction writer Larry Niven once observed that "The dinosaurs died out because they didn't have a space program." Fortunately we do have one, and former astronauts like Russell Schweickart. He's the chairman of the B612 Foundation, a group dedicated to developing techniques to divert asteroids which might pose a threat to Earth. So we're perfectly safe . . .
Last week, a group of scientists met in Atlanta to work through another stage of organizing the Amphibian Ark – a concerted effort to get zoos, aquariums, and botanical gardens worldwide to preserve threatened species of amphibian. They’re not protecting them from habitat destruction, although that’s certainly a problem for many of these species. They’re protecting them from a parasite. asHere's a cool story: a company called IntAct Labs in Cambridge, Massachusetts, has developed a method of generating small amounts of electrical power using a protein called prestin. The idea is that space suits, for example, could include a prestin layer which would use the astronaut's own movements to create power for various onboard systems. You could even cover a structure with prestin and generate power from wind. The story is covered at both BoingBoing and New Scientist. The prestin development is neat, but I'm not going to talk about that. I'm going to gripe about slapdash science writing. Look at the BoingBoing story again. The headline is "Ear-Hair Powered Space Suits" and the first sentence refers to "a protein found in human ear-hair." Trouble is, that's not what the story says at all. Hair cells in the ear aren't the same as hairs. The hairs in your ear are like the hairs everywhere else on your body. Hair cells are the receptors deep within the ear which turn the mechanical energy of sound waves into nerve impulses. The outer hair cells actually function as a kind of amplifier. This wouldn't be such a big deal except that BoingBoing is an incredibly popular and influential Web site (with science fiction writers among its contributors, no less). Lots of people will come away from this article with the impression that ear hairs make electricity, and that's just not the case. This is why I hate the kind of "Did You Know?" trivia factoids which too often pass for science reporting and education. Nobody's perfect, and we've made some errors ourselves here at Science Made Cool. But when you're reporting science, it's worthwhile to make sure you actually understand what you're writing before you hit the "post" button. Thanks to David Twiddy of 40 Years Ago Today for the story links. In the woods of Arkansas, a robot is hunting for a missing bird. The bird is the ivory-billed woodpecker, which attracted a lot of attention recently when it was sighted for the first time in decades after being thought extinct. The robot is a set of automated cameras, which can sit in the woods waiting to get a glimpse of the woodpecker much longer than any human observer could endure. Of course, it might be safe if we don't make robots too good at hunting. You never know. St. Valentine's Day has long been the annual celebration of romantic love. And romantic love usually leads, after suitable intermediate stages, to reproduction. Which makes it astoundingly ironic that the day before Valentine's Day is the birth date of Thomas Malthus, who is best known for pointing out the downside to reproduction. Malthus was an English clergyman and mathematician, and taught political economy at the East India Company's college. Early on in his career he became interested in population trends and what they might imply. In 1798 he wrote the first version of his famous Essay on the Principle of Population. In it he argued that population tends to increase geometrically while food production can increase only arithmetically -- each generation multiplies the number of breeders but can only add to farmland. And at some point, of course, you run out of farmland. If population continues to increase, you get famines. Malthus therefore argued in favor of limiting birth rates to prevent overpopulation. His work was a great influence on, among others, Charles Darwin (who almost shared his birthday). Darwin looked at Malthusian overpopulation, combined it with his own observations of individual variation, and came up with the theory of natural selection. When you have too many individuals competing for too little food, those with some advantage will be the parents of the next generation, and over time that advantage will spread through the whole population. Interestingly, though Malthusian models describe animal populations pretty well, they don't work for humans. The population crisis he envisioned in England never materialized. (Ireland did have famines, but they were sparked by a reduction in the food supply, not overpopulation.) Moreover, his fear that too many people would cause scarcity for all was unfounded -- more people meant more brains and hands. As England became more densely populated, it got richer rather than poorer. And after a couple of generations that led to a second rather startling discovery: when humans get rich, they stop breeding. The wealthiest nations have the lowest birth-rates. Why the discrepancy? I think it's simply that humans are not bacteria. We can make rational decisions. In rural 18th-century England, big families made sense -- more hands for the farm, and probably half of them would die of typhoid or gangrene anyway. In urban 21st-century England, big families don't make sense. In short, the way to defuse the "population bomb" is to let people get rich, and trust them to make their own decisions. Two hundred years after Malthus, that's still a radical idea. Tired of the same boring old oceans? You're in luck. Dr. Michael E. Wysession of Washington University has discovered a new ocean, right under our noses. Wysession analyzed a very large number of seismograph readings from earthquakes all over the world and did a great deal of number-crunching. What he found was that there's a large region under East Asia where earthquake waves get attenuated. This suggests something unusual about the rock down there -- it isn't as rigid and elastic as elsewhere. The best explanation is that the Earth's mantle beneath East Asia contains a lot of water, presumably plowed under as Asia grinds its way over the Pacific seabottom. And when we say "a lot of water" we mean a lot -- about as much as the Arctic Ocean. The idea of an underground ocean is a very old one. Jules Verne depicted one infested with sea monsters in his A Journey to the Center of the Earth, but it was an old idea even then. All the ancient mythologies had underground seas and rivers -- the Greeks had the Styx, the Egyptians the underground stream navigated by the boat of Ra, and so on. It's an obvious idea: water drains away downward, therefore there must be a lot of water underground. And if you look beyond Earth, underground oceans turn out to be relatively common. Mars may have one -- certainly there's a lot of water on Mars hiding someplace. Jovian moons like Europa, Callisto and Ganymede may also have them. But of course Earth has those big oceans right out in plain view, so nobody ever bothered to look underground before. Of course, this underground ocean isn't a bunch of big caves with open water -- rather, it's a mass of rock which isn't as bone-dry as other material in the mantle. So no point in trying to sell beachfront property a thousand miles under Beijing. But water in the mantle may serve as an important lubricant, helping Earth's tectonic plates slip and slide about. Still, it is a little odd to realize that Coleridge was dead on when he wrote about a "sunless sea" beneath Xanadu. 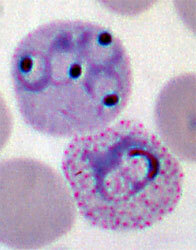 Four species of the genus Plasmodium are human parasites. All of them cause malaria. And while malaria’s characteristic and recurrent waves of chills and fever are a thing of the past in industrialized and temperate countries like the United States, the disease still kills more than a million people each year, mostly children in Africa. Plasmodium is a single-celled organism that cycles through two organisms: people and mosquitoes. Humans carry the parasite’s asexual phase. After it enters a new host, Plasmodium invades a liver cell and develops into a schizont – a structure that contains thousands of tiny clones of the parasite called merozoites. After a week or two, the schizont ruptures and releases the merozoites into the bloodstream. These new parasites find red blood cells, move inside, and repeat the process, munching on hemoglobin as they divide. Every week or two, the new schizonts rupture and release new merozoites, and the infected host gets sick again. Here's an interesting story from Popular Mechanics about meat. Mmm. Meat. Meat grown from stem cells, given texture by a kind of taffy-pulling machine. Why make meat? NASA wants to be able to feed its astronauts meat on long space voyages to keep them from going bonkers on a diet of tofu and Wheaties. But there just isn't the available space or mass to raise hogs (or even bunnies) aboard a Mars-bound vehicle. So, in rather stereotypical fashion, they went for an engineering fix -- find some way to synthesize it, so you can have a nice tidy machine making meat instead of messy animals. Where NASA goes, will the consumers follow? Nobody drank Tang until they started giving it to astronauts. Synthetic meat for space travellers would surely start turning up in stores. The vegetarians who avoid meat for ethical reasons could go hog-wild, eating hamburgers with both fists, chowing down on huge rare slabs of synthetic steak, and rolling around fully dressed in big tubs of stem-cell sausages. But will it replace the genuine article? To which I say: don't hold your breath. In the early days of the space program NASA spent considerable effort developing various kinds of "space food" in tubes and pouches. Now Shuttle astronauts go aloft with a fridge full of real food not unlike airliner meals (if you can remember the days when commercial airlines served meals, that is). It's all measured into proper nutritional proportions and combinations, which apparently the crews happily ignore once the nutritionists are safely left behind. And given how staggeringly, obesity-inducingly cheap meat from real animals is, I don't expect synthetics to replace it on most people's plates in the forseeable future. In this I'm going against the grain of generations of science fiction authors and other futurists, from Robert Heinlein to Winston Churchill (really!). But I like real meat, and I suspect most people do too. Synthetic meat will end up like, well, Tang -- a marginal commodity with a few very specialized applications. A few years ago, Tobias Landberg was asked to thaw out and skeletonize a monkey specimen for the Massachusetts Museum of Natural History. He made a little Quicktime movie as he worked.